Roger leads Francine into the twisted world of conspiracy theories; Steve and Klaus help Snot's family move into a new apartment. Francine is happy watching vapid morning talk shows and ignoring real world news. When she decides to surprise Stan at work she accidentally discovers that Stan has been running her favorite show in an attempt to shelter her from the real world. 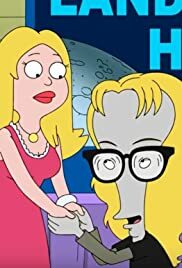 Francine turns to Roger who leads her into the twisted world of conspiracy theories. Meanwhile, Steve and Klaus help Snot's family move into a new apartment. Mrs. Lonstein: Eveything okay down here? Oh, you turned this into a darling little rumpus room. Klaus: Yeah, it's pretty sick. Mrs. Lonstein: Gosh, I haven't been in a basement like this since high school. Mrs. Lonstein: [Journey's "Lovin', Touchin', Squeezin'" plays on the jukebox] Ooh, this song. It really takes me back. Did I ever tell you about the summer I went on tour with a Journey cover band? Klaus: This is literally the first time we've met. Mrs. Lonstein: Mmm, air hockey? Klaus: No thanks. I don't feel like playing. Mrs. Lonstein: Aw, you're gonna make me play with myself? Not 1 laugh. Felt like a re-run and it was my first time watching it. Still passed the time at least. Linkin Park joke less than a year since the lead singers suicide. Poor taste and, besides that, still not funny. Hoping it gets better from here.